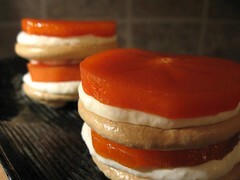 Persimmon Meringue Stacks - Do You Know The Muffin Man? Recipe from Shunju: New Japanese Cuisine by Takashi Sugimoto and Marcia Iwatate. Notes: The persimmons (I used Fuyu) are marinated in a wine syrup. It was difficult to whip just two egg whites in my mixer, so I used a trick I learned in school: elevating the bowl slightly by slipping a dishcloth underneath the brackets. The brown sugar meringue didn't form stiff peaks, but was more like marshmallow. They didn't colour as darkly as the photo in the cookbook. Nice contrasts and flavour. Santos has a very eloquent description of her rendition.